The CSS formatting model provides for a flow of elements and text inside of a container to be wrapped into lines. The formatting of elements and text within a line, its positioning in the inline progression direction, and the breaking of lines are described in [CSS3TEXT]. This module describes the positioning in the block progression direction both of elements and text within lines and of the lines themselves. This positioning is often relative to a baseline. It also describes special features for formatting of first lines and drop caps. It extends on the model in [CSS2]. GitHub Issues are preferred for discussion of this specification. When filing an issue, please put the text “css-inline” in the title, preferably like this: “[css-inline] …summary of comment…”. All issues and comments are archived, and there is also a historical archive. This module defines the CSS Inline Layout model, replacing and extending the model as defined in CSS2.1. It is very much a work-in-progress, and implementers should reference CSS2.1 for now. The root inline box is an anonymous inline box which is automatically generated to hold all of the inline-level contents of a block container (if it has any). It inherits from its parent block container, but is otherwise unstyleable. Note: Line boxes, like column boxes [css-multicol-1], are fragmentation containers generated by their formatting context and are not part of the CSS box tree. This section is being rewritten. Refer to section 10.8 of [CSS2] for the normative CSS definition or the 2002 Working Draft if you want pretty pictures. (But ignore the old text, half of it’s wrong. We’re not specifying which half, that’s to be determined.) The CSS2 specification should be used as the guideline for implementation. The CSSWG would like to know which baseline values are necessary: if any can be dropped, or any need to be added. See GitHub issue 859. Equivalent to alphabetic in horizontal writing modes and in vertical writing modes when text-orientation is sideways, sideways-right, or sideways-left. 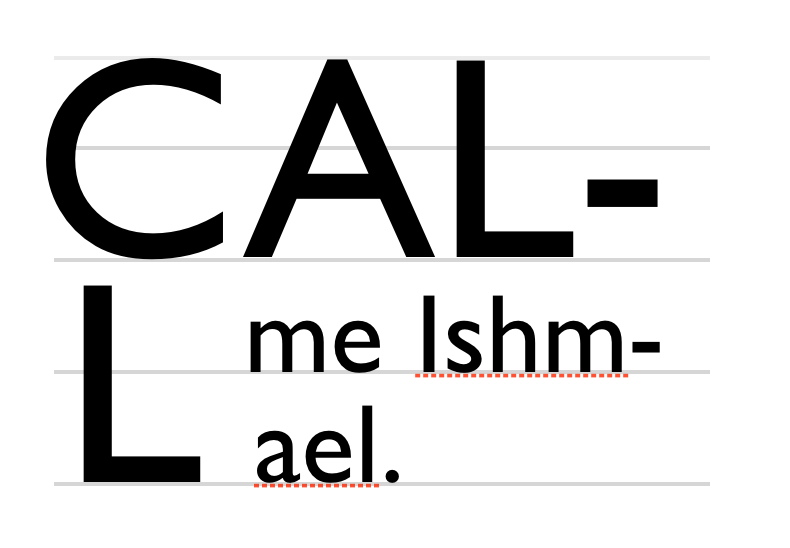 Equivalent to central in vertical writing modes when text-orientation is mixed or upright. However, in SVG text, the origin point of glyphs (used for coordinate-based glyph positioning) is always handled as for central in vertical writing modes. Use the bottom of the em box as the baseline. Match the box’s ideographic character face under-side baseline to that of its parent. Use the “middle” baseline: halfway between the alphabetic baseline and the ex-height. Use the central baseline (halfway between the ascent and descent). Use the top of the em box as the baseline. See [CSS3-WRITING-MODES] for an introduction to dominant baselines. Should be text-over and text-under instead of text-top and text-bottom, but maybe it’s better not to use those terms for consistency with legacy vertical-align. See GitHub issue 860. Add first and last values. Note, in this property, these are combinatorial, whereas in the align/justify-self/content properties, it’s singular. Do we want to align the syntaxes wrt hyphens vs. spaces or what? See GitHub issue 861. This shorthand property specifies how an inline-level box is aligned within the line. Values are the same as for its longhand properties, see below. Authors should use this property (vertical-align) instead of its longhands. This property will gain first and last keywords, like in the box alignment properties, see CSS Box Alignment 3 §4.2 Baseline Alignment: the baseline keyword and first/last modifiers. The open question is whether they should be added to alignment-baseline or a new sub-property should be created to hold the first | last preference. Specifies what point of an inline-level box is aligned to what point in the parent. Also selects the alignment baseline of boxes aligned with align-self/justify-self. Clean up this prose to correctly handle alignment contexts other than inline formatting contexts. Use the dominant baseline choice of the parent. Match the box’s corresponding baseline to that of its parent. Match the bottom of the box to the bottom of the parent’s content area. Match the box’s alphabetic baseline to that of its parent. Match the box’s central baseline to the central baseline of its parent. Match the box’s mathematical baseline to that of its parent. Match the top of the box to the top of the parent’s content area. For the following definitions, the alignment subtree is as defined in [CSS2]. Align the center of the aligned subtree with the center of the line box. These values are not allowed in the vertical-align shorthand. Authors should use the vertical-align shorthand instead of this property. Raise (positive value) or lower (negative value) by the specified length. Raise (positive value) or lower (negative value) by the specified percentage of the line-height. User agents may additionally support the keyword baseline as computing to 0 if is necessary for them to support legacy SVG content. We would prefer to remove this, and are looking for feedback from SVG user agents as to whether it’s necessary. The content area of the inline box is sized and position to fit its (possibly hypothetical) text as specified in CSS2§10.6.1. The logical height of the content area is calculated as the stretch fit into the line box. The box is then positioned such that its margin edges coincide with the line box’s edges. We might want to use this opportunity to more precisely define normal, rename it to match, and possibly introduce any other values that may seem necessary. The editors would appreciate any examples of drop initials in non-western scripts, especially Arabic and Indic scripts. Large, decorative letters have been used to start new sections of text since before the invention of printing. In fact, their use predates lowercase letters entirely. A dropped initial (or “drop cap”) is a larger-than-usual letter at the start of a paragraph, with a baseline at least one line lower than the first baseline of the paragraph. The size of the drop initial is usually indicated by how many lines it occupies. Two- and three-line drop initials are very common. Three-line drop initial with E acute. Since the cap-height of the drop initial aligns with the cap-height of the main text, the accent extends above the paragraph. The exact size and position of a dropped initial depends on the alignment of its glyph. Reference points on the drop cap must align precisely with reference points in the text. 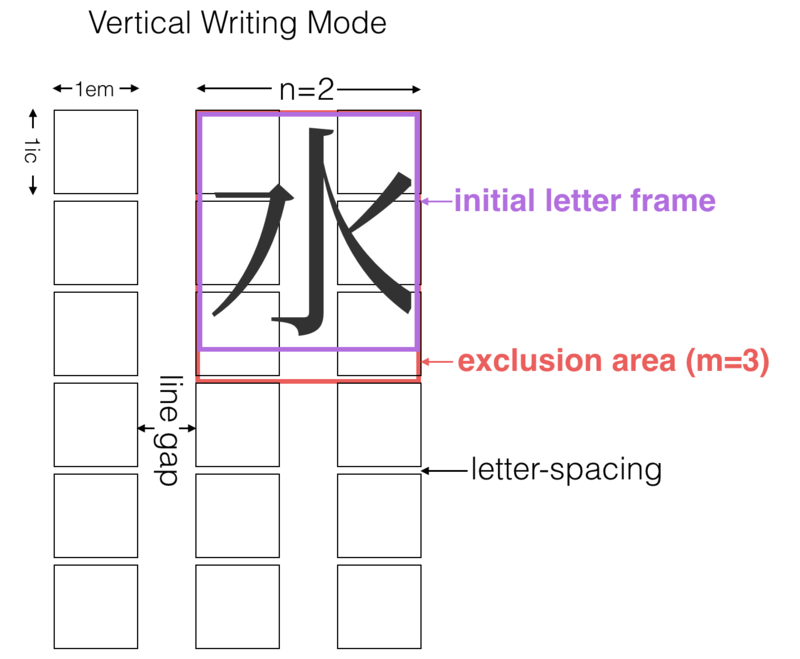 The alignment constraints for drop initials depend on the writing system. In Western scripts, the top reference points are the cap height of the initial letter and of the first line of text. The bottom reference points are the alphabetic baseline of the initial letter and the baseline of the Nth line of text. Figure 2 shows a simple two-line drop cap, with the relevant reference lines marked. Two-line drop cap showing baselines (green lines), cap-height (red line), and ascender (cyan line). In Han-derived scripts, the initial letter extends from the block-start edge of the glyphs on the first line to the block-end edge of the glyphs on the Nth line. In certain Indic scripts, the top alignment point	is the hanging baseline, and the bottom alignment point is the text-after-edge. 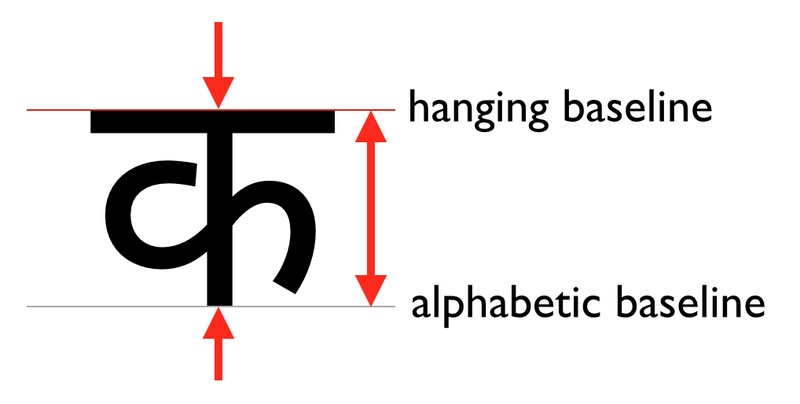 Devangari initial letter aligned with hanging baseline. Alignment points shown in red. Some styles of drop initials do not align with the first line of text. A sunken initial (or “sunken cap”) both sinks below the first baseline, and extends above the first line of text. Sunken cap. The letter drops two lines, but is the size of a three-line initial letter. A raised initial (often called a “raised cap” or “stick-up cap”) “sinks” to the first text baseline. Note: A proper raised initial has several advantages over simply increasing the font size of a first letter. The line spacing in the rest of the paragraph will not be altered, but text will still be excluded around large descenders. And if the size of raised initial is defined to be an integral number of lines, implicit baseline grids can be maintained. Raised cap. The initial letter is the size of a 3-line initial, but does not drop. Initial letters are typically a single letter, although they may include punctuation or a sequence of characters which are perceived by the user to be a single typographic unit. The ::first-letter pseudo-element, as defined in [SELECT], can be used to select the character(s) to be formatted as initial letters. Authors who need more control over which characters are included in an initial letter, or who want to apply initial-letters formatting to replaced elements or multiple words can alternately apply the initial-letters property to the first inline-level child of a block container. <p>This paragraph has a dropped “T”. <p><img alt="H" src="illuminated-h.svg">ere we have an illuminated “H”. <p><span>Words may also</span> be given initial letter styling at the beginning of a paragraph. Since ::first-letter selects punctuation before or after the first letter, these characters are included in the initial-letters when ::first-letter is used. Should there be a way to opt out of this behavior? See Github Issue 310. Renaming this property (and the others in this section) is currently under discussion. No special initial-letters effect. Text behaves as normal. This first argument defines the size of the initial letter in terms of how many lines it occupies. Values less than one are invalid. This optional second argument defines the number of lines the initial letter should sink. A value of 1 indicates a raised initial; values greater than 1 indiciate a sunken initial. Values less than one are invalid. If omitted, it duplicates the first argument, floored to the nearest positive whole number. An initial letter is an in-flow box to which initial-letters applies and is not normal; this triggers the special layout considerations described below. Represents a dropped initial 3 lines high, 3 lines deep. Represents a sunken initial 3 lines high, 2 lines deep. Represents a raised initial 3 lines high, 1 line deep. The size of the initial letter does not have to be an integral number of lines. In this case only the bottom aligns. To give authors more control over which characters can be styled as an initial letter and to allow the possibility of multi-character initial letters (such as for first word or first phrase styling), the initial-letters property applies not just to the CSS-defined ::first-letter pseudo-element, but also to inside-positioned ::marker pseudo-elements and inline-level boxes that are placed at the start of the first line. Specifically, initial-letters applies to any inline-level box—including any such ::first-letter or ::marker box—that is the first child of its parent box and whose ancestors (if any) that are descendants of its containing block are all first-child inline boxes that have a computed initial-letters value of normal. If initial-letters is applied to an inline-level box that is not positioned at the start of the line due to bidi reordering or which is otherwise preceded by other inline-level content, its used value is normal, and it is not formatted as an initial letter. Note: The initial-letters property cannot apply to any element whose float is not none or position is not static, because these values cause its display to compute to block. The effect of the initial-letters property is undefined on children of ruby base container boxes and on ruby container boxes. All properties that apply to an inline box also apply to an initial letter (unless it is an atomic inline, in which case the set of properties that apply to an atomic inline apply) except for vertical-align and its sub-properties, font-size, and line-height. Additionally, all of the sizing properties and box-sizing also apply to initial letters. Find the used font size based on its initial-letters size, initial-letters-align alignment points, and font metrics. Note that no layout is required in this step. The font size used for sizing the initial letter contents does not affect its computed font-size property (and therefore has no effect on the computation of em length values, etc.). Size the initial letter’s content box. If its width/height is definite, use that value (clamped as required by the min size and max size properties, and handling box-sizing as required) for that dimension of the box. In the case of a definite inline size, text-align is honored for aligning the contents of the initial letter within its box in the inline axis (using its inline-axis bearings as usual, not the bounding box of its glyph outlines). In the case of a definite block size, align-content is honored for aligning its contents in the block axis (using its block-axis bearings, synthesizing them if needed). Otherwise it is considered to have an automatic size in that dimension and is sized and positioned to coincide with the smallest rectangle that would include the bounding boxes of all its glyphs—excluding any that hang (see hanging-punctuation)—as well as the margin boxes of any atomic inlines it contains. Should the hanging punctuation be included in the box instead (so that the box is drawn around the punctuation when it is made visible through borders/background), but rather only excluded when positioning the box (so that the initial letter remains flush, with the hanging punctuation properly hanging)? See discussion. In the inline axis, the initial letter’s margin box is placed at the start edge of the line. If it is a non-atomic inline with an automatic inline size and has no padding or borders, it is negatively offset by the distance from the start edge of its content box to the point in the content that would have been placed at the start edge of the containing block if it had initial-letters: none. In the block axis, the initial letter is anchored to the dominant baseline of the first formatted line, positioned with respect to that baseline such that it would sink the number of lines specified by initial-letters’s second argument if its containing block held only the initial letter itself followed by an infinite sequence of plain text as the direct contents of its root inline box. Exclude content within the inline letter’s margin box according to initial-letters-wrap. Initial letters can be styled with margins, padding, and borders just like any other box. Unless initial-letters-align is border-box, its vertical alignment and sizing are not affected; however the effective exclusion area is (and corresponds to the margin area). When padding and borders are zero, the initial letter may be kerned; see below. As mentioned earlier, the alignment of initial letters depends on the script used. The initial-letters-align property can be used to specify the proper alignment. This property specifies the alignment points used to size and position an initial letter. Two sets of alignment points are necessary: the over and under alignment points of the initial letter are matched to corresponding over and under points of the surrounding text. Use the alphabetic and cap-height baselines of the surrounding text to align the initial letter. Use the ideographic character face bottom and top edge baselines of the surrounding text to align the initial letter. Use the alphabetic and (as yet theoretical) hebrew hanging baseline of the surrounding text to align the initial letter. Use the alphabetic and hanging baselines of the surrounding text to align the initial letter. Use the initial letter box’s line-over and line-under border edges as the over and under alignment points, respectively. Is there a proper typographic term for the hebrew “hanging” baseline? If the initial letter is an atomic inline, use its over and under content-box edges. Else if the initial letter contains any character from the Han, Hangul, Kana, or Yi Unicode scripts, use the ideographic character face bottom and top edge baselines. Else if the initial letter contains any character from the Devanagari, Bengali, and Gurmukhi Unicode scripts, use the hanging and alphabetic baselines. Else if the initial letter contains any character from the Hebrew Unicode scripts, use the ideographic character face bottom and top edge baselines. Else use the alphabetic and cap-height baselines. Note: The ordering of keywords in this property is fixed in case border-box is expanded to [ border-box | alphabetic | ideographic | hebrew | hanging ] to allow explicitly specifying the initial letter’s alignment points. This only covers the most common cross-linguistic transcription systems. Should we include any other / all script tags in the UA style sheet? The size of a drop initial is determined by the need to satisfy the required alignment. For an N-line drop initial in a Western script, the cap-height of the letter needs to be (N – 1) times the line-height, plus the cap-height of the surrounding text. Note this height is not the font size of the drop initial. A three-line drop initial in Adobe Minion Pro would have a font size of 61.2pt given 12pt text, 16pt line-height, and a cap-height of 651/1000 (from the font’s OS/2 table). The line height used in this calculation is the line-height of the containing block (or, in the case where a baseline grid is in use, the baseline-to-baseline spacing required by the baseline grid [CSS3-LINE-GRID]). The contents of the lines spanned, and therefore any variation in their heights and positions, is not accounted for. When initial-letters is not normal, shaping should still occur across the box’s boundaries, see CSS Text 3 §8.3 Shaping Across Element Boundaries. For example, if the first letter of the Farsi word “پس” were styled with initial-letters: 2 1, both letters would be styled in their joined forms, with initial-form “ﭘ” as the initial letter, followed by the normally-styled final-form “ﺲ”. Note that the two letters might not always graphically connect, even when shaped in their joining forms. Are there other things we need to consider here? The glyph(s) of an initial letter do not always fit within the specified sink. For example, if an initial letter has a descender, it could crash into the (n+1)th line of text. This is not desirable. Incorrect: three-line initial letter with descender. In this font, the capital “J” extends well below the baseline (shown in red). Text is therefore excluded around the glyph bounding boxes of the initial letters. The specified amount of sink (i.e the distance from the top alignment point to the bottom alignment point). The actual ascent and descent and side bearings of all the glyphs it contains that are part of its inline formatting context, even if they leak outside their em boxes. The margin boxes of all the atomic inlines it contains that are part of its inline formatting context, even if they leak outside its own line-height. The margin box of the initial letter is then made an exclusion area for subsequent text. In the inline axis, the position of the inline letter is given by aligning its start margin edge to the start edge of the containing block. However, if the initial letter is a non-atomic inline with zero padding and borders, the UA must apply an additional negative offset on the start side, of the amount necessary to optically align the first glyph to the containing block edge as it would be in normal text. Note: initial-letters-wrap is at risk. This property specifies whether lines impacted by an initial letter are shortened to fit the rectangular shape of the initial letter box or follow the contour of its end-edge glyph outline. No contour-fitting is performed: each impacted line is aligned flush to the end margin edge of the initial letter. Behaves as none if the first typographic character unit after the initial letter belongs to Unicode General Category Zs. Otherwise behaves as for all on the first line of the block containing the initial letter and as none on the rest. In the top paragraph, the initial letter "A" has a word space after it: the gap between the top of the "A" and the next letter provides the necessary word separation. 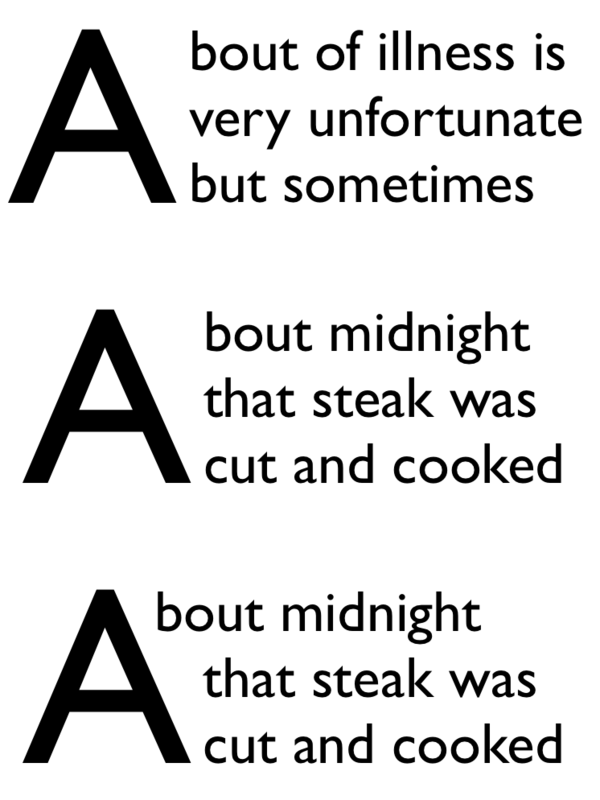 In the next paragraph, the initial letter "A" is part of the first word, and leaving a gap between the top of the "A" and the next letter would create a jarring visual break within the word. In this case, the first line of text should be kerned into the initial letter’s area, as shown in the bottom paragraph. For each line of text impacted by the initial letter, the line box adjacent to the initial letter starts at the start-most point that touches the ink of the initial letter, plus the amount of the initial letter’s end-side border+padding+margin. If the value of shape-outside is not none, shape-outside is used instead of the glyph outline. Note: This value is at-risk. This value is the same as none, except that the exclusion area of the impacted lines is increased as necessary for its end-edge to land on the character grid, i.e. to be a multiple of (1ic + letter-spacing) as computed on the containing block. The justify-self property can then be used to align the initial letter box within the exclusion area. Note: In this example, the exclusion area for the drop initial is larger than its glyph in order to preserve inline-axis alignment. Note: This value is also at-risk. This value behaves the same as first except that the adjustment to the first line is given explicitly instead of being inferred from the glyph shape. This really needs font-relative lengths to be relative to the used size. Note: This value exists because it is easier to implement. Authors are encouraged to use the first value and to set margins to control spacing, and to use this as a fallback for glyph detection if necessary. In the following example, UAs that support first will use the glyph outline plus the specified margin in order to place the first line, whereas UAs that only support <length> or <percentage> values will pull in the first line by 40% of the initial letter’s width (and then add the margin to that point). These values and related annoyance is likely unnecessary if someone submits a patch to Blink to support first. Ordinary initial letter with no wrapping. Text follows shape of initial letter. Each line box should just touch the ink of the letter, with some offset (represented by the shaded box). Only the first line is moved up against the ink of the initial letter. For a raised initial no special consideration is given for alignment and justification: it is treated similar to any other inline-level content. However, for a sunken initial its inline-start edge is anchored to the inline-start edge of the line box (after indentation) and text alignment affects the remaining content of the line in the remaining space, without moving the initial letter box itself. Note: The CSSWG was not aware of any reasonable use cases for mixing non-start text alignment with dropped initial letters, and this was the most sensible behavior proposed. This behavior may be reconsidered if use cases require otherwise. text-indent and hanging-punctuation apply to the first line of text as normal in the presence of initial letters. Lines affected by the exclusion are shortened, as in the presence of floats, and are affected the same way. Initial letter with text indent. The interaction of initial-letter and hanging-punctuation is under discussion. If the initial letter box is contained by inline box ancestors, the boundaries of those inline boxes are drawn to exclude the initial letter box, as if it were outside their startmost margin edge. This is a purely geometric operation: it does not affect e.g. property inheritance or the effective letter-spacing between the initial letter box and subsequent content. If an initial letter is too long to fit on one line, it wraps (according to the usual text-wrapping rules), each line filled and formatted exactly as if it were the first line and the initial letter too long to fit any subsequent normal text. Any normal text after the initial letter starts on its last line, affected exactly as if that line were the first line. Drop cap extends to two lines. The margin box of an initial letter contributes to the size of its containing element. Initial letters that extend above the first line of text, known as “raised caps” or “sunken caps,” do not extend up into previous elements. Since the content box for an initial letter includes all glyph ink, this also means that accents or other ink above the cap height of an initial letter will not impinge on previous elements. Raised cap (initial-letters: 3 1) on right; note that the position of the “C” is the same in both cases, but on the right all text is moved down relative to the initial letter. Handle glyph ink above cap height of font. Proposal: Make it an exclusion area for line boxes and border boxes. Include margin specified on initial-letters as part of exclusion area in order to control spacing. Draw a box model diagram here. Does the margin of the initial letter collapse with its container? The red text is a short paragraph with an initial letter. Note the subsequent paragraph wraps around the initial letter just as text in the paragraph with the initial letter does. If the subsequent block starts with an initial letter, establishes an independent formatting context, or specifies clear in the initial letter’s containing block’s start direction, then it must clear the previous block’s initial letter. The red text is a short paragraph with an initial letter. The subsequent paragraph clears because it also has an initial letter. The clear property does not care about initial letters: it neither applies to initial letters nor clears them when applied to nearby floats. Like line boxes or floats, initial letter boxes must not overlap the margin boxes of any floats participating in the same block formatting context. An overlapping initial letter box is shifted inward or downward until either it fits without overlapping or there are no more floats present. If a line box’s start edge shifts or moves down to clear a float, an initial letter originating in it moves with it; likewise if an initial letter shifts inward or moves downward to clear a float, its originating line box and subsequent line boxes shorten and/or move accordingly. If an inline-start float originates in the first line of content adjacent to an initial letter, then it moves past the initial letter towards the containing block edge, exactly as if the initial letter were any other inline-level content. However, if such a float originates in subsequent lines of content adjacent to a (sunk) initial letter, then that float must clear the initial letter. In the absence of an initial letter, the first line of text could abut the blue float. But the presence of the initial letter requires that the text move over. Whether an inline-end float originating in subsequent lines must clear the initial letter (as inline-start floats do) is still under discussion. There is no aesthetic reason to require it; however it’s yet unclear how the underlying layout model would distinguish between the two cases. Since a single glyph cannot be fragmented across pages (or columns or other fragmentation containers), an initial letter is considered monolithic [css-break-3] for the purpose of block-axis fragmentation (breaking across pages, columns, regions, etc.). Additionally, breaks between the in-flow lines alongside an initial letter box are avoided, much as breaks between line boxes affected be widows and orphans are avoided. However, if there is a forced break alongside the initial letter box, then it takes precedence; but has no effect on the initial letter box itself. As with other monolithic objects, if an initial letter box occurs at the top of a fragmentation container and that fragmentation container is too short to contain it, it may be either truncated or sliced. Adjacent content, however, must be fragmented according to its own rules, not truncated or sliced along with the initial letter. The center of the minus sign (U+2212) can be taken as the mathematical baseline. 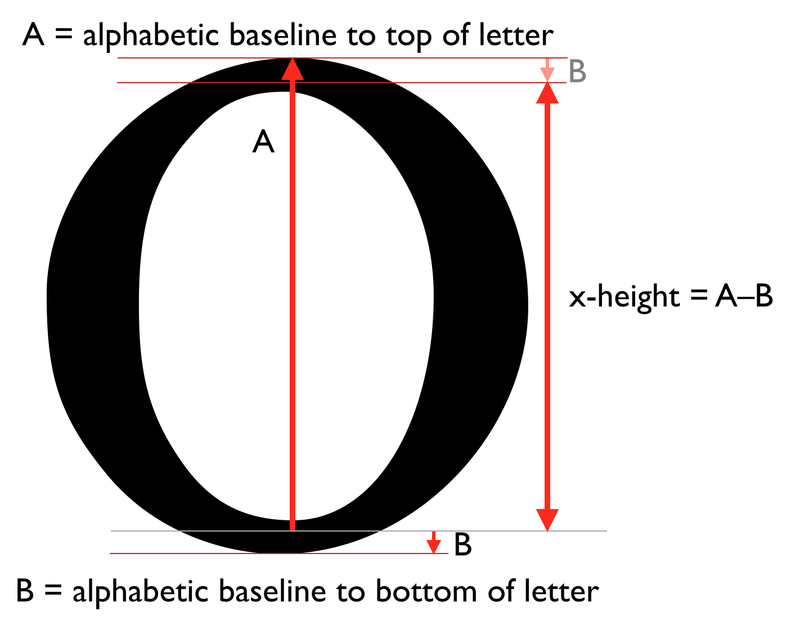 The amount by which the lowercase “o” descends below the alphabetic baseline can be subtracted from its highest point to measure the x-height. The amount by which the uppercase “O” descends below the alphabetic baseline can be subtracted from its highest point to measure the cap-height. The top edge of the below ideograph (U+4E05 “丅”) and the bottom edge of the above ideograph (U+4E04 “丄”) can be taken as the ideographic character face edges. In the horizontal dimension, the left and right edges of the nation ideograph (U+56FD “国”) or reason ideograph (U+56E0 “因”) can be used. In all cases, the these edges should be measured at their intersection with the central baseline in that axis. What is the best character to use for the sides? The top edge of the center of the Hebrew maqaf (U+05B3 “־”) can be taken as the Hebrew hanging baseline. The hanging baseline is at the top edge of the character ink. Issue: Add more notes here? Somebody sanity-check these heuristics please. Copy over text from CSS Writing Modes and expand for additional baseline values. Note: Authors can use margins (positive or negative) to adjust the alignment of replaced content within a line. In this example, the author is using a set of images to display characters that don’t exist. Improved recommended default UA style sheet rules for initial letters. Special thanks goes to the initial authors, Eric A. Meyer and Michel Suignard. David Baron, David M Brown, Oriol Brufau, John Daggett, Stephen Deach, Sylvain Galineau, David Hyatt, Shinyu Murakami, Tess O’Connor, Sujal Parikh, Florian Rivoal, Alan Stearns, Bobby Tung, Chris Wilson, Grzegorz Zygmunt.